Terminalia prunoides is a shrub or small tree that is often multi-stemmed and produces greenish-white flowers followed by red to purple winged nuts that stay on the tree for a long time – very decorative. Terminalia prunoides is a shrub or small tree that is often multi-stemmed and does not appear to be very tidy due to its drooping branches. 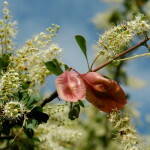 The greenish-white flowers are followed by red to purple winged nuts that stay on the tree for a long time. It is very decorative. Plant Terminalia prunoides in a well-drained soil and protect from frost when young. It can be trimmed occasionally to keep it compact.